« Why Should I Have A Paver Patio Installed? It’s time to do some spring-cleaning on your lawn. Winter can wreak havoc on your lawn, especially after one as cold and brutal as the one we just experienced. While we already provide you with seasonal lawn care tips (check spring out here), we’ve got a few more to throw your way to help you get started with your spring lawn maintenance as soon as possible. Clean and Repair – You have to start somewhere with your lawn, and this is one of the best places to start. Once your lawn dries out, take a rake to it and even everything out. You should also grab a shovel and even out any divots in the ground created by thawing frost to help your grass and other plants grow better. Once you’ve done this, go through and aerate your lawn. The soil can compact during the winter and you want water and seeds to easily permeate the ground. Plant Grasses – If there are spots that your grass has died or just stopped growing, you may need to reseed those areas. This is the time of year to do it. Make sure that your soil is evenly spread and that whatever issues made the grass die in the first place are addressed. Don’t forget to monitor growth and water your grass throughout the season, as well. Maryland gets a lot of rain, but sometimes it’s not enough. Check Lawn Care Equipment – This equipment can fall into disrepair during the winter months, when it isn’t being used on a regular basis. You should clean, replace the fluid, and check test run all of your lawn equipment before you plan on actually using any of it this spring and summer. It’s also a good idea to change air filters, blades, and other removable equipment. Don’t let your lawn fall into disrepair just because the past winter was difficult. 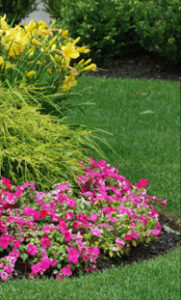 You should get started on cleaning and repairing your lawn as soon as you get the chance. If you don’t have the time, or want professional grade work, you should consider hiring a landscape maintenance company that knows how to take care of Maryland lawns. This entry was posted on Wednesday, April 9th, 2014	at 8:04 pm	and is filed under Lawn Tips	. You can follow any responses to this entry through the RSS 2.0	feed. Both comments and pings are currently closed.